I watched it on HBO Go. Anyone else watch it? Thoughts? I liked that the filmmakers resisted the urge to make this a lot of fearmongering about the Slenderverse. I think you could still read it that way if you have the bias - in particular one of the dads of the girls frequently references his regret over giving his daughter an Ipad - but overall they showed a lot of restraint. Memes and the Slenderverse meme are explored, including their dangerous potential, but not used as a scapegoat. At the end of the day, the film is much more about mental illness and it is clear that both of these girls were at diminished capacity to separate right from wrong at the time of the vicious assault. One of the girls, Morgan, clearly has schizophrenia, and a pretty bad case of it too. Psychosis is on the table for the other girl, Anissa, and the word delusional disorder is bandied around while talking about her. I doubt that she has the delusional disorder I’ve seen in adults, with delusions that persist despite argument from loved ones - the girls kept these ideas close to their chest, cutting off the potential of alternate perspectives, and the delusion does not seem to have persisted for her too long after she was taken into custody and people were like, “WTF were you thinking?”. But yeah, she definitely had a psychotic break with delusions at the time of the crime, I have no doubt about that. The real enemy of the film is the judge’s persistent decision to keep them out of juvenile court. I’m not sure how I feel about that, to be honest - I can sort of see where the judge is coming from, because the crime WAS so horrific, but at the same time, it is an assault to logic when at the end of the movie the judge is basically like, “Yeah, their brains weren’t fully developed to make decisions, the defense proved that, but they’re getting older every day” (he literally said that, WTF, they didn’t commit the crime TODAY! ), “and uh the crime was a really big bad crime so they should be in the big bad courts” (that part is more paraphrasing). Honestly my opinion is that both of these children need psychiatric care, not prison. Unfortunately, the state hospitals in my area just closed down and we are predicting a lot of them will “go forensic” (i.e., commit crimes and wind up in jail). So I know that we live in a social culture that is not really warm and fuzzy about appropriate psychiatric care for people with mental illness who commit crimes. That said, it was a little chilling watching the taped police interviews and even parent interviews at times. I think that if I were a member of the victim’s family, I’d be PISSED. There are times where the victim feels entirely erased from the movie, it’s all about the plight of the attackers. It’s a little hard, in particular, watching the taped police interviews where the girls go on and on about how hard it was for THEM while they were attacking their friend. Morgan in particular comes off as cruel in her detached tone and I can see her making a really bad impression on a lot of people. It wasn’t until the film started making a rock-solid case for her schizophrenia that I realized that her cold and detached affect was likely due to the negative symptoms of schizophrenia. Morgan’s dad has schizophrenia too and it was heart-breaking every time he spoke. I don’t blame the parents at all, schizophrenia generally doesn’t show until people are in their early twenties and I doubt they could have known that it would have hit their daughter so young. The Slenderverse is actually kind of cool when it doesn’t inspire socially isolated girls with mental illness to try and kill their friend. By which I mean, I think it’s neat that a bunch of teenagers are having fun shooting horror movies on their cameras and sharing it with each other and building this huge canon together. This girl who wrote Gundam Wing and Magic Knight Rayearth fanfiction as a preteen appreciates that. It seems like there’s a major case of preteen white girls either killing or try to kill one of their friends at least once a decade. And it almost always surprises us, like PRETEEN WHITE GIRLS WTF? But humanity’s potential for violence knows no boundaries, really. I wrote too much, I’m sorry. 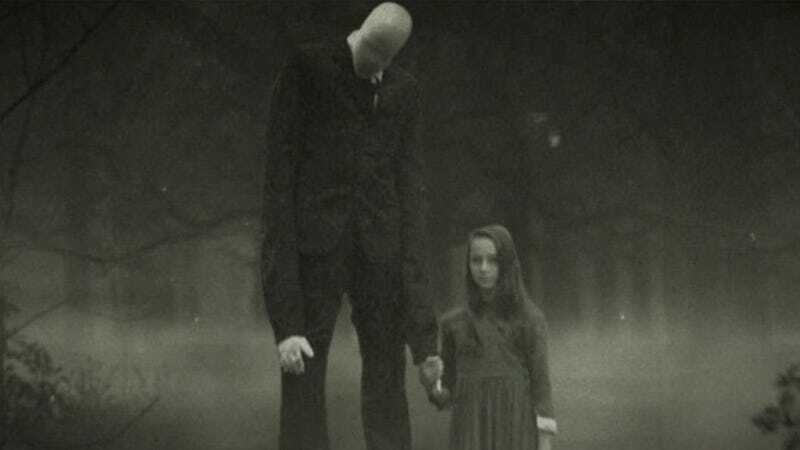 Have more Slenderman.